Note: Click on illustration to enlarge image. More sportsmen are becoming interested in the “score” of their buck’s antlers. While there are several scoring systems, each with its own set of rules, the Boone and Crockett (B&C) system is widely accepted as the standard from which all others were developed. 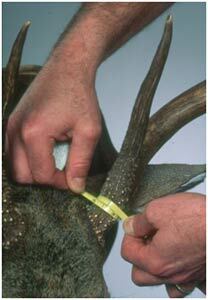 SCDNR’s Antler Records Program utilizes the B&C system. Before the rack can be officially scored, it must have air-dried for at least 60 days, cannot have a broken skull plate, and cannot have artificially replaced or repaired points. 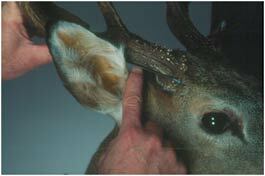 Antlers in velvet are not eligible for entry into SCDNR’s Antler Records Program. 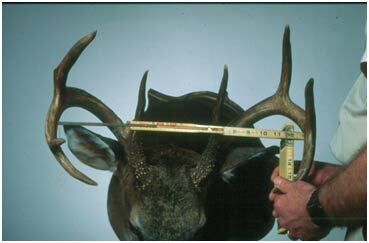 Most sportsmen envision the “typical” set of deer antlers to be symmetrical with 6, 8, or 10 points arising in a normal manner from the antler beam. However, deer antlers can develop into countless formations that often vary drastically from the “typical”. These are referred to as “non-typical” antler formations. The rules for scoring non-typical racks are lengthy and complicated and usually require the knowledge of a trained B&C measurer to score them correctly. 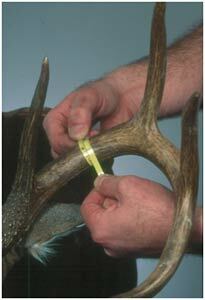 Therefore, this exercise will only discuss techniques for scoring typical antlers. Note: all measurements are made to the nearest 1/8th inch. Normal points arise from the top of the main beam and are usually symmetrically paired with similar-length points on the other antler. B&C denotes the main points on antlers as G1, G2, G3, etc., with G1 being the brow tines or eye-guards. The other points are numbered consecutively. 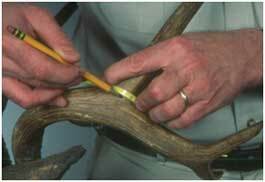 Before starting to score the antlers, match the normal points from one side with those on the other side. If a point is unmatched at the end of a main beam, it is considered a normal point and a zero is entered for the measurement of the missing point on the opposite beam. If a point is unmatched between two normal points, it is considered abnormal and the length is recorded in the abnormal point section. The most common error relative to normal points is inappropriately matching points from one side to the other. Note: the tip of the beam is not measured as a point because its measurement is included in the length of the beam. For scoring purposes, not all protrusions are measured as points. To qualify as a point, the projection must be at least one inch long with the total length exceeding the width of the point at one inch or more of length. To measure the length of a point, you must first establish the base of the point. This is accomplished by placing the steel cable or 1/4 inch tape along the top of the main beam or along the parent point across the base of the point being measured. Use a pencil to mark the base where the cable or tape crosses the bottom of the point as if you were going to “cut-off” the point from the beam. The point length is then measured from the tip to this base along the center line of the point using the steel tape. Any point that does not arise from the top of the main beam is considered an abnormal point. Abnormal points include drop tines and points arising off other points or the burr line. The two most common errors in determining point length is measuring the length from the center or bottom of the main beam and measuring protrusions that do not meet the criteria to be a point. 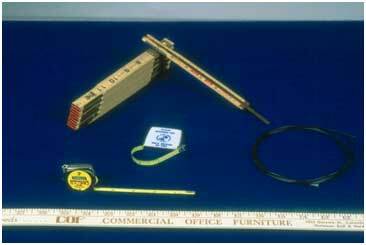 The length of the main beams is measured using the flexible cable. Start by finding the lowest edge on the burr line in the center of the beam (about a 45 degree angle from the back corner of the eye) and use this as the starting point for the length of that beam. From the starting point, lay the cable along the outside of the antler, following the center of the beam out to the tip and measure the cable length with the yard stick or steel tape. The most common error incurred is using a steel tape that does not flex when bending around the curve of the beam. Four circumference measurements (denoted as H1, H2, H3, and H4) must be recorded for each beam. The H1 circumference is the smallest measurement between the burr and the origin of the first point (G1). If there is no G1, take the circumference at the smallest point between the burr and G2 and use this measurement as H1 and H2. All other circumference measurements are taken at the smallest point between the succeeding G points. If there is no G4, H4 is taken half-way between the center of the base of G3 and the tip of the main beam. In the case of a normal 6 point where there is no G3 or G4, find the half way point from G2 and the tip of the main beam and take the circumference there and use this as H3 and H4 measurements. The most common errors relating to circumferences are using the largest circumference measurements rather than the smallest and not recording an H4 for beams without a G4. The inside spread of the main beams is measured at a right angle to the center line of the skull at the widest point between the main beams using the carpenters ruler or steel tape. Inexperienced measurers will often angle the measurement to get the greatest inside spread regardless of the angle of the tape relative to the skull. The inside spread credit may equal but not exceed the longest main beam length. For example, if the inside spread is 20 inches, and the longer of the two main beams is 18 inches, then 18 inches is used as the inside spread credit. The most common error relating to measuring inside spread is not being perpendicular to the skull at the widest point. 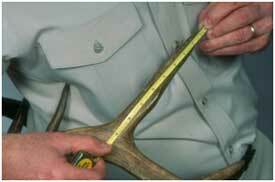 The underlying basis for scoring antlers is symmetry between the left and right sides. Therefore in scoring a typical rack, differences between the same measurements from each side are deducted from the gross, or total, score. Abnormal points are also deductions. To calculate the score, first find the differences between each corresponding measurement, such as G1 on the left minus G1 on the right, for all G-point measurements. Do the same for each H measurement. Add all of the deductions to get the total deduction number. To get the gross score, add the inside spread, beam lengths, all the G-point lengths, and all H-circumference measurements. Finally, subtract the total deduction number from the gross score to get the final, or net, score. The most common errors in score calculation are addition and subtraction errors. Illustration of Deer Scoring. The minimum net score required of a typical white-tailed deer B&C entry is 170 for the all-time records and 160 for the three year awards period book. For entry into South Carolina’s Antler Records Program, the minimum required score is 125 net for typical racks. For additional instructions on scoring, visit www.boone-crockett.org.